Charter Career Prep students recently completed an innovative project that strengthened students’ math and critical thinking skills by designing and manufacturing scale model pool tables at every stage. The engaging, fun project is typical of the program, which emphasizes making learning relevant through hands-on projects and vocational opportunities. Students individually design their pool tables and then collaborate in groups of two or three to bring their ideas to life. El Dorado County Office of Education Charter Career Prep educators are passionate about providing tailored alternative education to ensure all students successfully transition to career or college opportunities. During this project, table models and pool cues must be to scale and range from 6" by 12" to 24" by 48". Students begin by researching full-size pool table dimensions, then scale down their measurements and design their table on paper. These tables must be fully functional with a ball return system to gather the balls for the next game. Once the design and list of materials is completed, they start building. Frequently, students identify design-flaws or a better way of construction and must troubleshoot and revise their project. They finish the pool tables using felt and paint or stain. Charter Career Prep, which is located in the town of El Dorado, works to prepare students to be college and career ready through engaging, rigorous curriculum. Throughout this project, students learn drafting/drawing, scale calculations, and material measurements and use shop equipment to cut, sand, shape, fasten and drill. They also use skills that will benefit them throughout their lives. More information about Charter Career Prep can be found on the school’s website at ccp.edcoe.org or by calling (530) 621-2579. 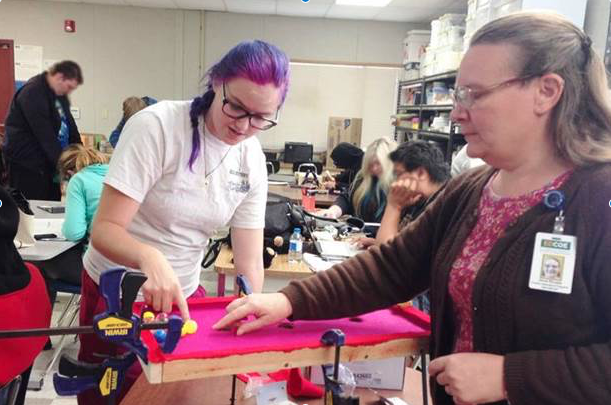 High school senior Rachel Seward and teacher Anne Rhoads work together to stabilize the table and adhere felt to the table’s top.